Instead of the current setup in which rendering for an object fails if the drawable, texture, or material have any sort of mismatch, there would be only one structure: a Renderer. The Renderer structure would contain that which is currently split across 3 different structures. Its job would be to take all of the components (each VBO making up the mesh, all of the texture resources, constants such as ambient light levels, and the effect file) and create a working way to draw any given positionable. This will not be as efficient as the previous setup in terms of bind/unbind calls, but it will be more powerful. This would coincide with the addition of an effect file parser, and a simple preprocessor for shaders. (example) Effects can be created for multiple GLSL versions, with or without major engine features such as HDR, MSAA, deferred shading; and with or without other resources within the render, such as the presence of texture coordinates or specular maps. This will also allow very simple live-editing of in-game options, making it so the engine will almost never need to be restarted. In addition, it will simplify in-game shader recompilation, and hot reloading of shaders. It will also simplify the object tracker, and the overall rendering path, as well as implementing most of what’s necessary for render clusters. constant.c, for uploading per-object data such as global ambient values and other uniforms. Should have a way to put user-specified data in the future, but this will require a lot of boilerplate code to interact with all of the glUniform calls. Contexts manage the global OpenGL state. They contain bits of information, such as currently bound objects, the active viewport, and the window size. Viewports manages rendering of scenes, and contain a number of stages. They can be used to implement in-game security cameras and such. Stages represent one pass of rendering, such as for deferred shading or HDR tonemapping. 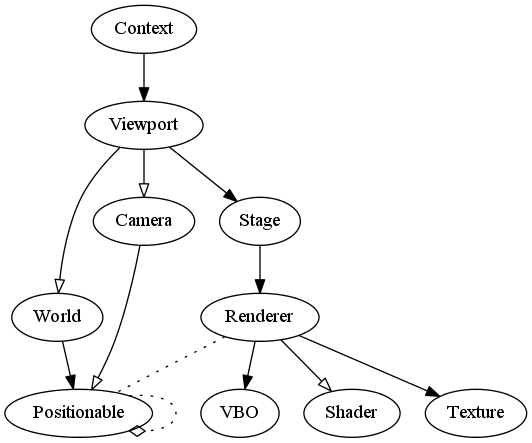 Renderers are all of the data needed to render an object - VBOs, shaders, textures, uniforms. Worlds are 3-dimensional spaces containing objects and other information for describing the world - this is shared by both graphics and physics. Positionable are objects that can be positioned in the world. Cameras are the point of view for the Viewport, and contain information like the projection matrix and position/rotation of the viewer.